Heating and cooling a home with air conditioning accounts for 50-70% of the average American home’s energy consumption. Considering such a large portion of your power bills are due to keeping your home comfortably warm or cool, you certainly don’t want any of that costly temperature-controlled air escaping through your walls or ceilings…and yet that’s exactly what’s happening. Thankfully, Dimensional Contracting has the attic insulation installation services that will cut down on air leakage from your home and help your air conditioning work efficiently and effectively. That means you save money in the future by investing in your home’s energy efficiency now. As an added bonus, you will also reduce your energy usage and make your home more environmentally friendly. Completely free, with no obligation, consultation that includes a thorough inspection of your home’s insulation. Properly insulating your home is one of the most cost effective ways to reduce energy bills and save money. Our attic insulation installers from Dimensional Contracting are true professionals. Before the work even begins, our trained technicians will thoroughly evaluate your home. We start by inspecting existing insulation, testing ventilation systems, and assessing your home’s energy consumption and expenditure before tailoring the perfect attic insulation plan for your home. We customize the insulation installation to the needs of your home and make sure you get the most comfort and savings for your money. We’ve got a reputation for punctual arrivals, thorough workmanship, full mess cleanup, and hassle-free paperwork. We can get in, get the job done, and get out, leaving you with a properly insulated attic that can reduce your heating bill by 10-50%. Don’t just take our word for it, read testimonials from real clients and decide for yourself. We have over 15 years of experience as insulation installers in Dallas and the Fort Worth area. The basic premise is that heat flows from the hot areas to the cold areas due to thermal physics. That means that when its warm inside in the winter, your heat is trying to move through the insulation barriers, cracks, and crannies of your home, and into the cold spaces in your walls, attic, basement or crawl space. In the summer its moving the opposite direction. Heat is trying to get into your house, moving into the cool areas of your home from outside through the roof, walls, and windows of your home. Insulation serves to slow down that movement of heat and works to retain the heat inside your home during the winter while keeping the heat out during the summer. The effectiveness of insulation is measured by its resistance to heat flow, which is also known as the R-value. Having proper insulation means that your HVAC unit will have to work less to keep your home heated or cooled. That translates into less electricity consumption and lowers your monthly utility bills. It also makes your house a lot more comfortable. 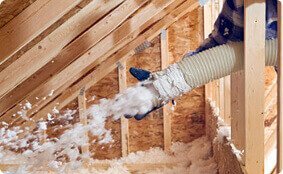 There are various kinds of insulation for different applications, such as spray foam insulation which is used to create an insulating barrier inside your walls. Radiant barriers are not technically insulation, but they are used to assist in the overall insulation efficiency of your home by reflecting heat in your attic. To get the most effective comfort in your home and stay insulated year round, you’ll want to make sure you have every area covered. Don’t settle for an air-conditioned home at the cost of soaring energy bills. Upgrade your home’s comfort and energy-efficiency today by setting up a free consultation with our attic insulation installers.